Sofia has some very fine luxury hotels, and there is no doubt there has been some heavy and astute investment in providing fine accommodation for visitors, be they business travellers or tourists coming to explore. The Sense Hotel Sofia is an exceptional example of this trend, a hotel where the most modern materials and fine design can be seen throughout. The style is unmistakably 21st century, featuring floor-to-ceiling windows that allow in lots of space, reflective, smooth wooden floors, curvy, minimalist furniture and pastel-shaded decor with plenty of glass and steel. Designed by Lazzarini Pickering Architetti and Architectural Group Tzonkov, the hotel also has a remarkable reflective glass facade, which captures the images of all the surrounding buildings of the city. The concept behind this is enabling the hotel to blend in with its surroundings, meaning it can be extremely modern, yet sensitive at the same time. All this provides a great treat for the senses – and there is more. It could be said that the hotel has its own art gallery, but it would be more accurate to say that the Sense Sofia is an art gallery. This means guests can enjoy a rich, varied and fascinating collection of artworks, but with the added novelty of being somewhere that feels nothing like a normal art gallery or museum. Of course, any trip to Sofia has to involve some sight-seeing, but guests can start this without even leaving the hotel. 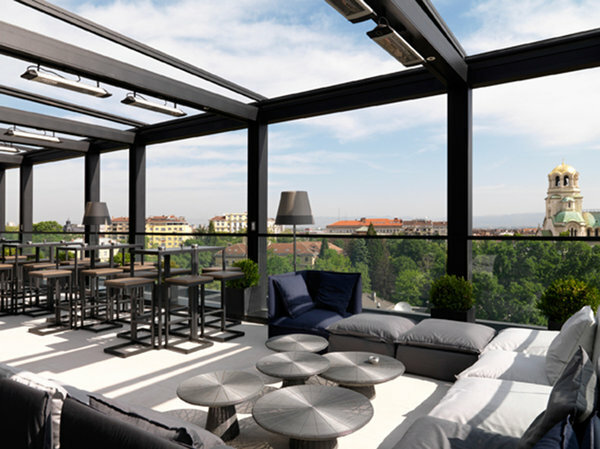 The rooftop bar is situated on the ninth floor and offers a large and spacious terrace, where one can gaze across the cityscape or up at the stars. In this lofty and relaxing atmosphere, guests can enjoy some premium spirits and wine, as well as the fine foods of this gastro bar, made with fresh and nutritionally-balanced ingredients. Whether on a date, enjoying the company of friends or simply relaxing at the end of a hard day doing business, the bar offers a fresh experience for the senses, almost a world of its own suspended high above the rest of the city. Quite simply, the Sense Sofia is sensational.